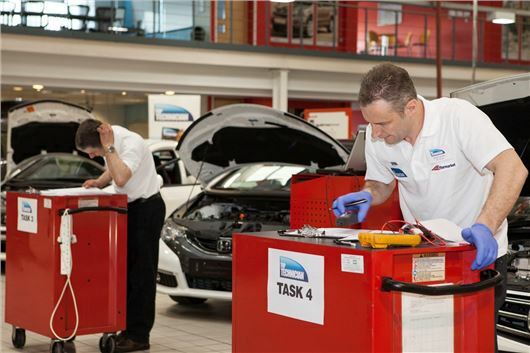 Top Technician 2014 has been launched with the task of finding the UK’s best vehicle servicing professional. Prize funds worth more than £10,000 are on offer and the national competition is open to any vehicle technician with three or more years professional experience. Technicians wishing to take part need to take an online test paper before 3 March 2014, while a second, advanced online test from 19 March will narrow the field to just twelve contestants. The talented 12 will be invited to attend a half day of practical semi-final heats on 4 April. The six finalists then go forward to a day of intensely challenging tasks at the Honda Institute in Slough on 16 May. Free to enter, Top Technician attracts a broad range of industry professionals from independent workshops, franchised dealerships, fast fit chains and specialist one-man-band operations. “It’s that time again for Britain’s technicians to show just how good they are at finding and fixing faults, and keeping the nation’s thirty million cars safely and economically on the road,” says Top Technician project manager, Nicola St Clair. “The vehicle servicing sector is still too frequently the target of unwarranted and ill-informed criticism and it remains a significant objective in Top Technician’s mission to redress that imbalance by showcasing the excellence of servicing experts across our industry,” added Nicola.